245 other birds have this item in their bag or wishlist! Have wanted one of these towels for ages and this one doesn't disappoint. Still looks nice after being washed. Love it. Great for beach, what's not to like about these towels? Light weight ,love the colour. Delivery of items so quick !! This is such a great quality cotton towel and I bought one for myself (apple green) and two as gifts (Azure & Aqua). They fold up so small, but are quite large when opened up. Plus, Birdsnest were super fast in posting and always package purchases in a lovely way. Thanks. 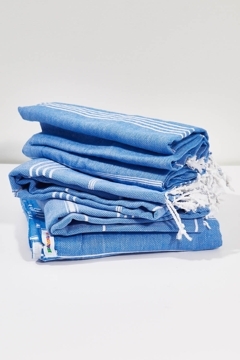 These towels are perfect for not taking up too much space in a bag or suitcase, look great and can also be used like a sarong. I bought three of these towels in different colours for Christmas presents, and they are gorgeous. More lovely than expected and the colours are great. Purchased as a gift for my Mum ... I already have one and love my Hammamas. Have purchased for others in the family too! Love these and find so useful for sitting on beach,picnics, travel and wrapping around self. This towel rolls up to be very small and lightweight. Perfect for travelling.